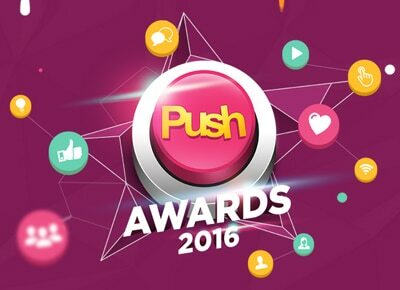 Official voting for Push Awards starts on July 24. After its successful debut last year, Push Awards is coming back for year two. The biggest digital media awards organized by ABS-CBN’s entertainment website PUSH.com.ph is recognizing once again the main celebrity newsmakers and influencers online. Just like last year, Push Awards would have the Push Digital Awards Category where those who pushed the limits of social media platforms would be acknowledged. For Facebook there’s the PushLike award, for Twitter there’s the PushTweet award, for Instagram there’s the PushGram award and for YouTube there’s the PushPlay award. The Push Awesome Award category would still highlight the top viral and top trending personalities. Under this category are the subcategories: Awesome Baby, Awesome Family, Awesome Selfie Queen, Awesome Selfie King, Awesome OOTD King, and Awesome OOTD Queen. This category would also cite the notable performances like the Awesome Lip Sync Performance, Awesome LOL Performance, Awesome Song Cover Performance, and Awesome Song Dance Performance. The Special Awards Category is also coming back with the Push Elite and Push Ultimate Fan category. Winners under the Push Elite category would be chosen via votes for the aforementioned Digital Media Awards. Categories include the Male Celebrity of the Year, Female Celebrity of the Year, Group or Tandem of the Year, Music Artist of the Year and Newcomer of the Year. The most passionate fans meanwhile would be getting the recognition they deserve through the Push Ultimate Fan award.